Using Jelastic PaaS becomes even easier! We have already made it easy for you to deploy your applications, with no code changes required. But if you wanted to deploy and run an application, you still had to create the environments that the application needed, had to read a how-to and then come through its steps to get the app running. Now Jelastic eliminates all that work and automates the process. There is no need to read the instructions or submit support tickets to get an app up and running. With Jelastic application packaging you have a great possibility to deploy a necessary application to Jelastic right from the application home page or from Jelastic site skipping all the steps of manual installation. Just imagine the whole range of apps that will be available for effortless hosting: CMS systems, wikis, portals and many, many more. Jelastic makes things really easy! 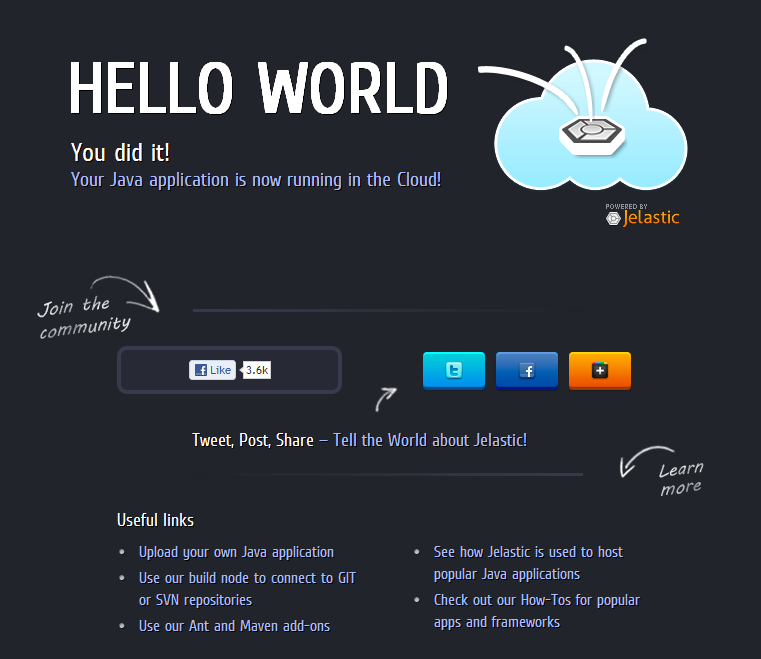 Jelastic App Packaging allows you to skip most of the steps required during manual installation: thanks to its one-click deployment option, anyone can deploy a Java app to the cloud, even if they are not tech-savvy at all! 1. At the home page of the application (or at our site) you can see Get it hosted now! button. Click it. 2. In the appeared field enter your email address and press the pointer. 3. Check your email. You’ve been sent a confirmation link. Click it to be redirected to Jelastic dashboard. If you have already Jelastic account (registered for the email you’ve entered) you’ll log in automatically. If you don’t have Jelastic account, you’ll be signed up automatically and get the email with your login (the email you’ve entered) and password. 4. At the dashboard you’ll see the Confirm installation of application window with a short information about the application you want to deploy. 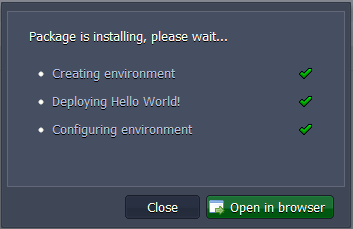 Type the name of environment you want to create for deploying your application and click Install. 5. The process of installation begins. Wait a minute for Creating, Deploying and Configuring to be finished. 6. Click Open in browser button. In a minute your application will be opened. The deployment process has never been as easy as now! Enjoy!